The debate about whether bitcoin is a bubble, a fraud, or the greatest financial innovation since the ATM too often degenerates into shouting and name-calling. The bitcoin detractors say bitcoin buyers are relying on the “greater fool” theory of investing. That’s when you pay a high price for something of little value in the hope that some greater fool comes along and takes it off your hands at an even more ridiculous price. Bitcoin supporters shoot back by saying the critics are technophobes and Neanderthals who don’t understand the brilliance of the blockchain and how it is the wave of the future. (By the way, it’s typical for bitcoin boosters to pivot away from the currency to the technology. In fact, they’re two very different things. The blockchain has a future; bitcoin does not). Such tendentious sparring is unproductive and unenlightening. What’s needed is a more scientific basis for judging bitcoin. This article provides that kind of scientific analysis. It’s a bit longer and more technical that the articles we usually recommend, but it’s well worth your time. 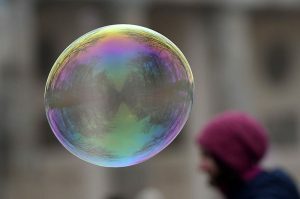 The article begins with the observation that increasing volatility along with increasing price is a good bubble indicator in any market and suggests an underlying instrument will soon be worth zero. But, the author observes declining volatility with higher prices in bitcoin suggesting it’s not a bubble and there is real money in the market. Yet, these real money reduced volatility episodes seem interspersed with hot money inflows and periodic higher volatility. This suggests a tug-of-war between real money and hot money that go could either way. That’s a valid observation, but there’s another possibility the author does not consider. The continual reduction in volatility in response to price increases suggests autoserial correlation (a kind of “smoothing” in which the futures resembles the past only more so). Autoserial correlation appeared in LTCM (a sign of excessive leverage to achieve smoothing), and in the Bernie Madoff case (a sign of accounting fraud to lull investors into complacency). The appearance of autoserial correlation says bitcoin may be in for a dramatic crash or be revealed as a massive fraud — perhaps both.